God Didn’t Lie… Nor Did I Make Him A Liar! Today’s message has been a long time coming… and I do mean a long time! In fact when you get down to the nitty gritty of it, today’s sermonet – “God Didn’t Lie… Nor Did I Make Him A Lier!” – actually began to become a “reality” on the 16th of March 1984 when I finally gave my life to Jesus. Because it was on that fateful day that Jesus began the process of putting me to the test of proving my love for Him. Now, never in my wildest imagination could I have ever envisioned what that Scripture would mean to me some twenty-eight (28) years after having given my life to Christ. I mean when it comes to the part about “loving Jesus more than your own wife”, it soon became all too apparent that the cross Jesus had commanded me to carry (in my salvation walk with Him) was the one my wife (Annie) was going to nail me to if I chose to follow Him instead of her. That was God’s promise to me! And the “enemy” He was referring to was none other than my “ex-wife” Annie who likewise had me arrested fifty-seven (57) days later (the 29th of April 2004) and incarcerated for one hundred and twelve (112) days. However, it was shortly after my release from jail on the 20th of August 2004 that the Lord God Almighty added to His Psalms 37 “promise” by giving me the guarantee that He would not allow my “enemy” to put me in jail again. You see at the time of Moses, the Lord God Almighty promised that the priesthood would continue in the family of Aaron “forever”. But yet when Eli walked unworthily in his priestly position, it became mandatory that the Lord God Almighty make His promise “null and void”. I mean, God Almighty cannot honor those who don’t honor Him. Therefore it was due to Eli’s unfaithful service that God had to go back on His Word and became a liar. I’ve seen it happen all too often! In fact it was in 2005 that the Lord had me write a sermonet entitled “Christians Who Make God A Liar!” It was a very simple message but a very serious warning to two of my Brothers in Christ who had done exactly that. However, it was only a few weeks ago that I had to publish yet another sermonet on one of these same Brothers – “How Alan Richardson Forsook Christ For Christmas!” You see Alan didn’t allow God’s first warning to make a change in his life… and the second time he made God a liar it became fatal! So that’s the introduction to this message. 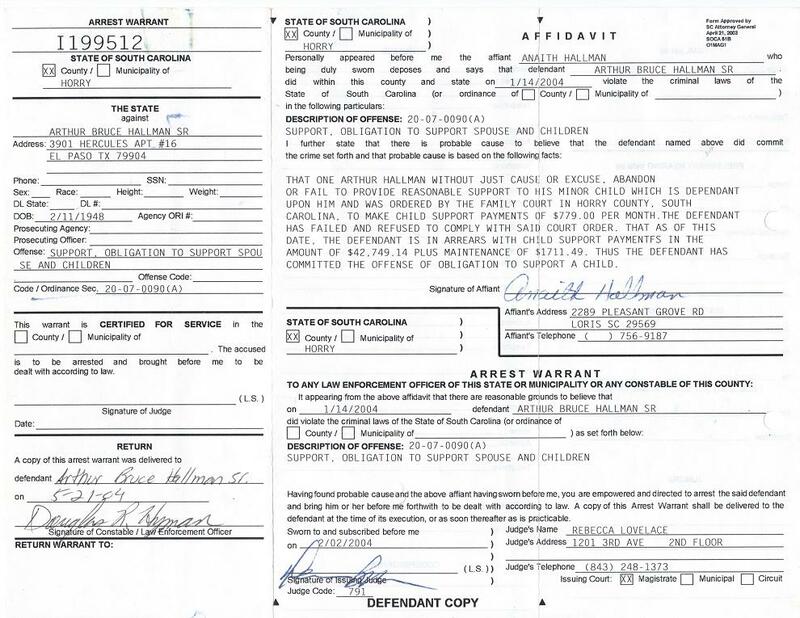 And now let me give you some of the details of what I had to go through (my cross) in order not to make God a liar concerning His promise that I would not go to jail again for my ex-wife Annie. The year was 1975. I had done my tour of duty with the U.S. Air Force and was in my third year at Clemson University working on my engineering degree. I was running from God and partying like a fool when I met Anaith (Annie) Delores Gonzalez. We lived in sin for several months before making our sin legal with a government marriage license on the 3rd of October 1975. I knew it was not what God wanted, but I did it anyway. After graduation we continued our life of partying. We tried to start a family, but after three miscarriages it became impossible for Annie to have children. So in 1983 we adopted our first child from Annie’s country of birth, the Republic of Panama. This was the first of seven (7) children that we would bring into our family from her native country, and with all but two (2) of them it became necessary for Annie to spend an extended amount of time in Panama doing the paperwork. However, what I would all too soon discover was that Annie had more than the children in mind during her trips to Panama. She had several men on the side (so to speak) and partied quite hardy without me. She was not only draining me of cash, but her unfaithfulness was driving me to the point of suicide. That is until the 16th of March 1984, when in total desperation, I chose not to end my life but to give it to Jesus instead. That was the beginning of my walk with Christ. And even though Annie did not follow my example by doing the same, I was at peace with my God. 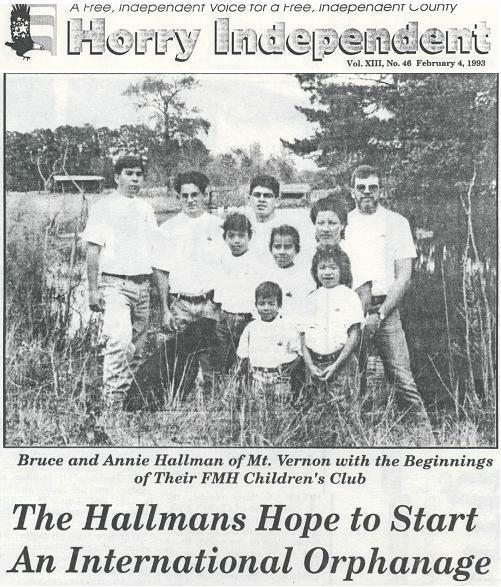 With the children in mind, and planning to bring many more into the family, we purchased an 80-acre farm in 1987 with the help of my mother’s inheritance (Frances Mitchell Hallman – the FMH in FMHCCI). I truly love the farm life. And before it was all said and done we had a working farm with chickens, peacocks, geese, ducks, goats, pigs, cows, horses, and a vegetable garden. We even had a hayfield to provided food for the livestock. However, it was only a few years later that the Good Lord informed my wife Annie that we were to “move to Texas and don’t turn back”. So that was His reason for me leaving my cherished farm? I immediately responded with, “But I have my own fishing pond on the farm!” Which He likewise immediately responded with, “But I want you to go fishing for men!” And with that in mind, I knew exactly what I had to do. As the Lord would have it, my employer (AVX Corporation) was in need of an engineer in Juarez, Mexico. So the transfer was done quickly and on the 1st of January 1994, my son (Luis) and I drove into El Paso, Texas, to set up camp before moving the rest of the family. Taking my wife’s advise, we would look for a ranch to purchase while they sold the farm. What a mess! But I didn’t give up hope! In fact by the end of 1995 I was able to get the kids moved in with me in Texas. But then by the end of 1996 the Lord had me to take another job, which meant I could no longer keep the kids. My new employer was The Toro Company. And as I would soon find out, I was there to minister to the CEO, Ken Melrose, who likewise claimed to be a follower of Christ. However, it was shortly after “Brother” Melrose confided in me that the Lord showed me corruption in his company that he was unwilling to deal with which likewise caused me to get fired on the 25th of March 1999. What a mess! But yet the Lord assured me that this was where He wanted me (jobless in El Paso), and through it all I was going to learn to “trust Him”. He even told me that I wouldn’t get a job until He got me my job back with The Toro Company. A piece of cake, right? Well, the cross that I had been given to carry started to get pretty heavy as the days turned into weeks, the weeks turned into months, and the months turned into years without a job. The money was running out fast, and that’s about the time Annie figured she had better get what she could while there was still some to get. So with the money in mind, Annie filed for divorce on the 29th of September 2000. What a mess! What was I going to do? No job, no money, with the only available source of cash being my half of the farm. And it was right about then, in my darkest moment, when the Lord gave me the answer to my question. Because what He told me, in no uncertain terms, was that I was to do absolutely nothing! The divorce was a sham, and I was not to comply with any of the court’s demands. The Lord then went on to tell me that He was going to overturn the divorce, and get back the farm, based on Annie’s use of “entrapment” and “defamation of character” in winning the divorce. Great! Just what I wanted to hear! My cross was getting heavier by the minute! 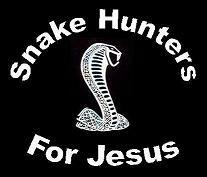 I was now becoming an outlaw for Jesus! But it only got crazier from that point on until the 20th of May 2002 when I officially became homeless for Jesus and moved into the Rescue Mission of El Paso as assistant Chaplin. The homeless journey was a trip to say the least, but a blessing in that I was able to minister to so many homeless people. But yet the constant threat was always there concerning what happens to the “fathers” who don’t pay their court-ordered child support. And that’s the way it was until that fateful day – the 29th of April 2004 – when one of El Paso’s finest pulled me over and took me to jail. One hundred and twelve (112) days in lock up, but it was not even over yet. Because it was shortly after my arrival back in El Paso that I started getting regular threats from the South Carolina Department Of Social Services. And of course as the threats implied, if I didn’t pay up on my child support they would take my land as compensation. Unmerciful harassment! I was more than ready to throw in the towel and give them the land, but the Lord warned me not to do it. And then came the real kicker! 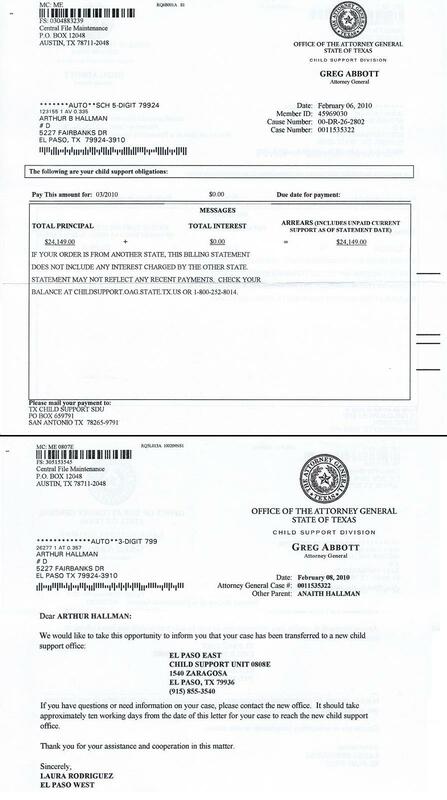 On the 6th of February 2010 my delinquent “child support” case was transferred to the state of Texas. No longer would they have to transport me back to South Carolina to stand trial. They could now take care of the matter in El Paso. Things were not looking good at all, but the Lord continued to tell me that everything was going to be all right. But then it was a few months after having informed the Texas Attorney General that I would not be able to oblige him with the cash he demanded I pay that I received a subpoena to appear in court on the 17th of June 2010. Things were not looking good at all! It certainly appeared as though I was about to get a prison term, and I was not looking forward to my day in court. But then by the grace of God, one of the Brothers in Christ volunteered to hire a lawyer in my defense. By the time he made the offer I only had a few days left to find a lawyer to represent me. Well the first lawyer I approached was the one chosen by God. She was just what I needed, and likewise accepted the case. But then three (3) days before the trial she called back to say that she wouldn’t be able to represent me. She recommended another lawyer who might take the case, but yet that lawyer recommended another. So it was only two (2) days left before my hearing by the time I sat down with a lawyer to explain my case… and only to have him refuse me once again. This was insanity to say the least! I had one day left to get a lawyer, and it was the next one that I tried who unwillingly agreed to take my case. She didn’t feel as though she would be much help in my defense, but she agreed to give it a try. Well, the next day we showed up for court. My lawyer petitioned the court for an extension in order to prepare my case, and the judge was nice enough to grant it. That was pretty much the prayer meeting. I forgave Annie for all the evil she had done, and seriously asked the Lord to save her from her sins. Then five (5) days later, the 23rd of June 2010, Annie died. Well, it didn’t take long to see God’s mercy at work in Annie’s death. My lawyer said that the state would no longer send me to prison for non-payment on the child support. The worst thing they could do would be to suspend my driver’s license. 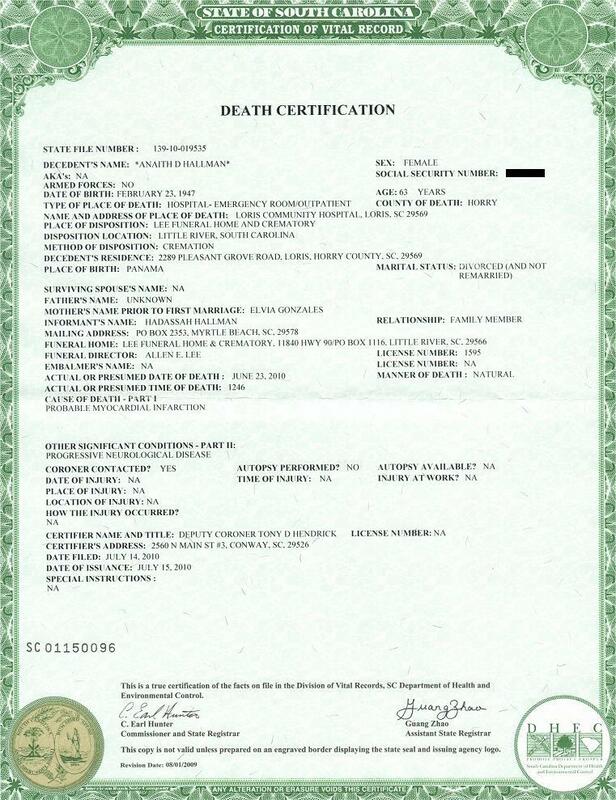 So I quickly ordered a copy of Annie’s death certificate for our upcoming trial. Then came the hearing on the 27th of July 2010. Everything went well with the exception that the judge demanded a commitment from me on a monthly payment on the child support. I told my lawyer that I would not commit to making any payments, but she could tell him whatever she pleased. Well the two of them agreed that I was to pay $40 per month, but I was not about to pay a penny. I wasn’t looking forward to losing my driving license, but I was not going to disobey God. And then on the 23rd of October 2010, I received a letter from the South Carolina Department Of Social Services releasing me from my child support debt. Not only did Annie’s death keep me from going to prison, but it totally wiped out my “arrears” (as they called it). I was no longer legally obligated to pay the $40 per month to the Texas Attorney General. Glory to God! He is Good! But there’s still more! 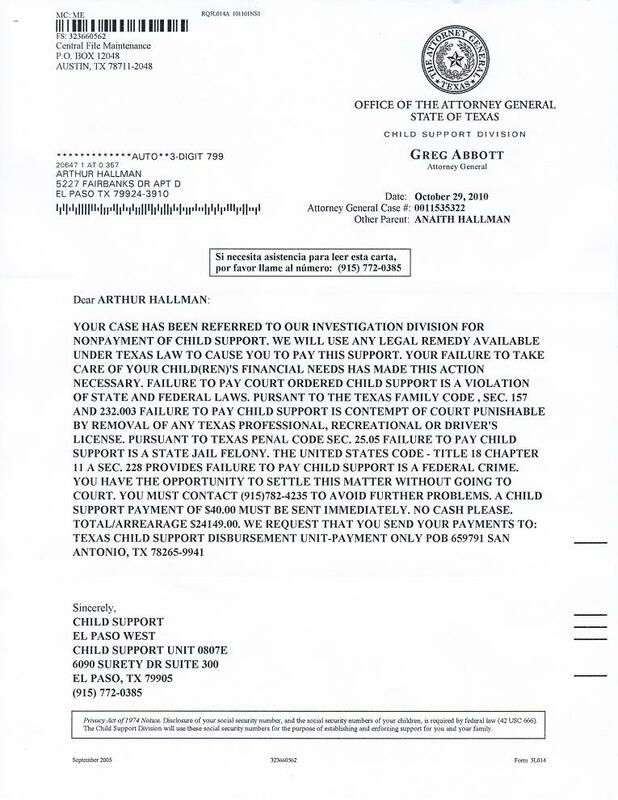 Because it was only six (6) days later, the 29th of October 2010, that the Attorney General of Texas sent me a threatening letter stating that my case had been turned over to their “Investigating Division” for nonpayment of child support. 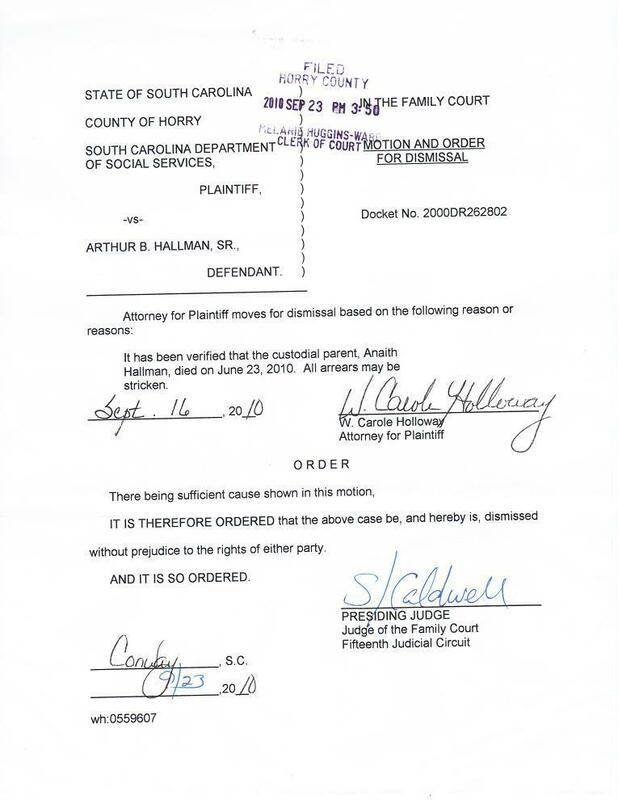 So with letter in hand I gave them a call and informed them of the court order from South Carolina releasing me of all obligations with the child support. I asked the nice lady if she had received her copy yet, and that was right about the time she checked her mail and found the proof of what I was saying. I did not make her day, and that was the last time I talked with the Texas Attorney General’s office. In fact I have heard absolutely nothing more from them since. So, there you have it: “God’s Not A Liar… Nor Did I Make Him A Liar!” God was faithful in His promise to me because I was faithful in my obedience to Him!